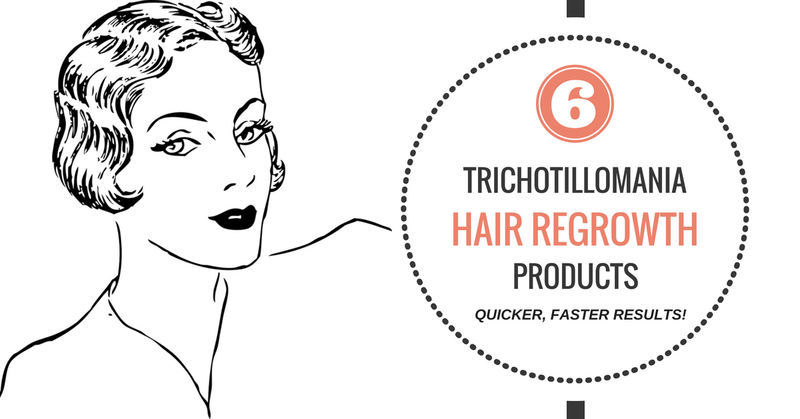 6 Trichotillomania Hair Regrowth Products For Faster, Quicker Results! Trichotillomania Hair Regrowth Products & Tips For Faster Results! Patience is a virtue but not when it comes to hair regrowth. We want hair and we want it now! There’s nothing more motivating than seeing those hair seedlings growing faster when you have hair loss due to trichotillomania. I’m always encouraged when I see progress quicker, especially in the area of hair regrowth. Below you will find some products and tips to help promote faster trichotillomania hair regrowth. Many of the products are oil based because oils are needed for healthy hair to grow. 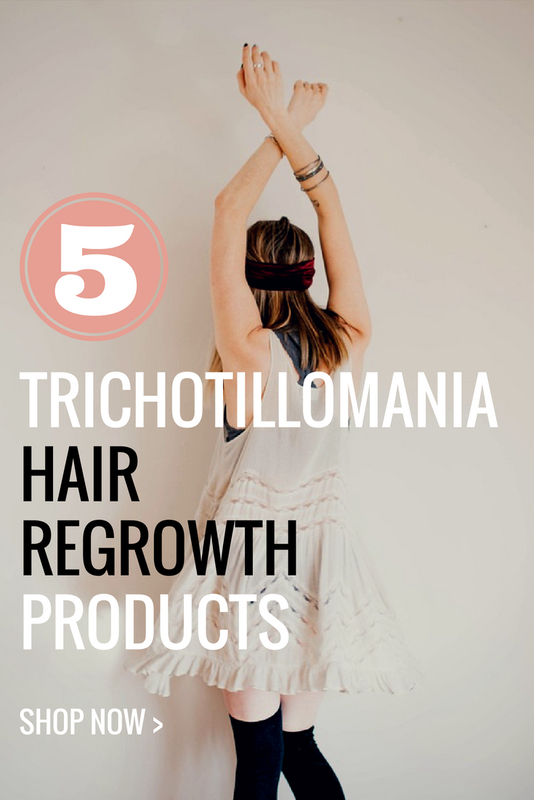 Here are some of the best hair regrowth products for people with trichotillomania. Trichup oil is one of those ancient Ayurvedic secrets that no one tells you about…except me. You can’t even find this stuff in stores, you have to get it on the black market  .. I mean Amazon. 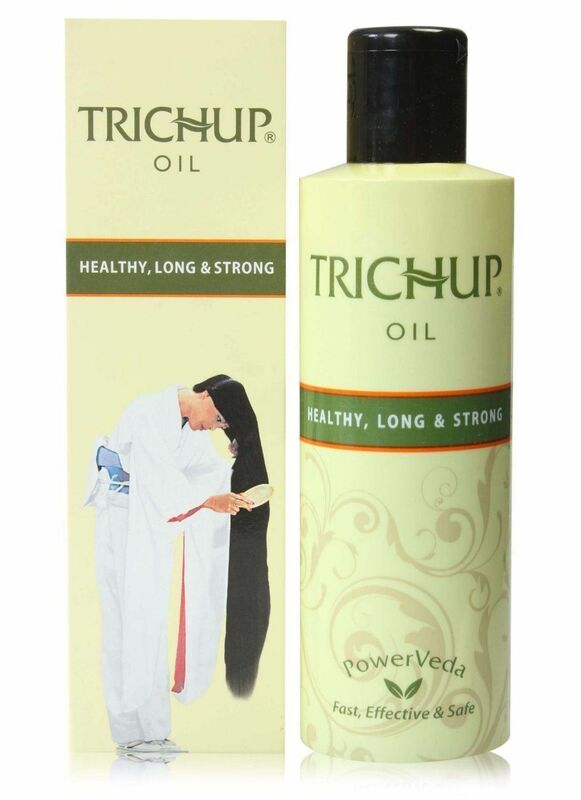 Trichup is known to promote fresh hair regrowth and improve blood circulation to hair tissues and follicles. Trichup stimulates the hair melanin (pigments responsible for giving hair its color).  The best time to use it would be at night before bed after shampooing. Massage the Trichup Herbal Oil into the scalp with your fingertips (or scalp massager) and leave it overnight.  Do this twice a week for quicker, stronger, healthier hair regrowth. Trichup is not super expensive, it’s just not available anywhere you can drive to get it. This stuff comes up all the time in the groups, it’s a fairly inexpensive trichotillomania hair regrowth product that a lot of people use to grow their hair back faster. It can be used on hair or eyebrows which makes it a popular choice for all trichsters. Black castor oil is less sticky and easier to apply to hair than regular yellow castor oil. If you have ever tried to use regular castor oil, you know what I mean, it’s really thick and kinda greasy. Castor oil is known to grow hair at 3-5x times the normal rate and it’s natural and inexpensive. This product came reccommended to me from a hair dresser because she said it would promote healthier, faster hair regrowth and help protect my hair against the pool and blow dryer damage. There’s a noticeable difference in growth in about 2-3 weeks on bald spots. I like it because it’s not too heavy and oily. It detours pulling because it’s hard to get a grip on the hairs. It leaves hair moisturized and soft. It’s faster hair growth at an affordable price. This conditioning treatment smells dreamy and leaves your hair feeling soft as soft can be. The Roots is a rinse out conditioner; leave it in for a little while to let it take effect and then rinse it out. It has a “cooling” effect to it, similar to the way that Prohibere feels. It has a soothing sensation on the scalp which keeps the area calm and less irritated. The Roots is a natural “fertilizer” for your hair, the ingredients include olive oil, shea butter, peppermint oil, meadowdoam seed oil, sweet almond oil, chamomile extract, hydrolysed wheat protein and castor oil. The Roots comes highly reviewed and rated for quicker, better hair growth at an affordable price. This product is phenomenal, especially if you’re at the point where you just don’t know what to do with your hair. It uses biotin, zinc, iron, saw palmetto, beta-sitosterol, horsetail extract, nettle extract, fo-ti, pygeum bark powder and green tea extract. This formula contains clinically proven ingredients to regenerate failing hair follicles. Read the reviews on Amazon, they are stellar. It has 100% money back guarantee. This supplement can be used with the topical hair oils mentioned above. Cannabidoil (CBD) is found in hemp. CBD is non-psychoactive and it has a lot of health benefits for hair. A high quality Cannabidoil is nutrient-rich, packed with the right vitamins for stellar hair growth. CBD oil contains a lot of protein and hair is mostly made of proteins. It strengthens the weak and damaged strands and follicles and improves elasticity. Hemp oil contains important fatty acids that promote hair growth and make hair healthy and shiny from the roots. A good Full Spectrum, organic, non-gmo CBD oil can be used orally as well as topically and research suggests that it has amazing mental health benefits as well. This brand here has a 30-day, empty bottle, money-back guarantee. Related: 3 Ways I Changed My Haircare Routine For Dramatic Hair Regrowth! What About Rogaine (aka Minoxidil)? Rogaine, aka Minoxidil is a medication that is used primarily for people with hormonal or genetic hair loss. It’s a fairly inexpensive foam (for men or women) that’s supposed to improve blood flow to the scalp and enlarge the hair follicle gradually. There’s really no evidence that Rogaine helps people with trichotilloma grow hair faster. Some say it does, some say it doesn’t.  It’s the #1 doctor recommended topical solution for hair regrowth.  But It’s Not For Trichotillomania! 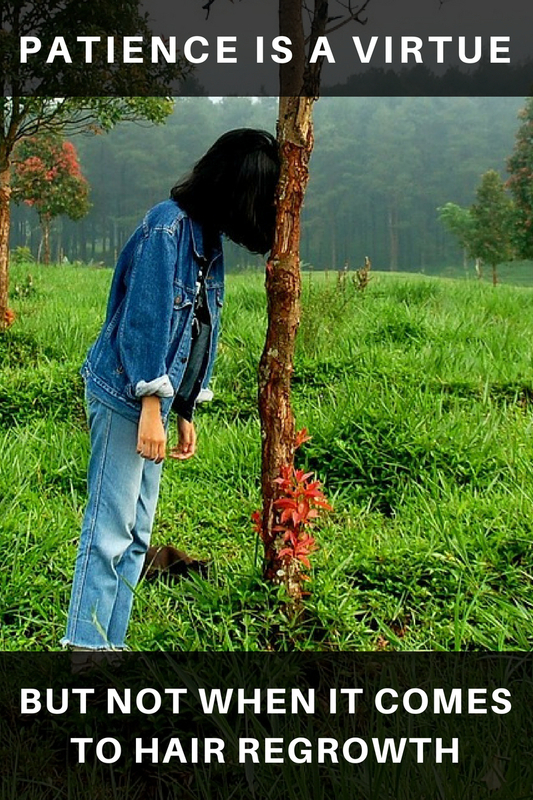 Hair pulling disorders and genetic or hormonal hair loss are totally different, whether or not Rogaine works for hair regrowth in people with trichotillomania is still not clear. Rogaine (Generic Name is Minoxidil) can be found at just about any retail store and even some grocery stores. These scalp massagers are used in the shower while shampooing to stimulate the scalp. They are known for making hair grow faster because they stir up the natural oils and boost blood circulation. Keep one of these in the shower with you and when you wash your hair use it. Drinking a lot of water helps a lot because it keeps your blood circulating and your body hydrated. I’m taking a of natural supplements and the water helps keep those moving through my body for healthier, faster hair regrowth. Drinking a lot of water will make you pee a lot at first, try to pace yourself without forgetting (which is my biggest problem), use one of these to make it easier. 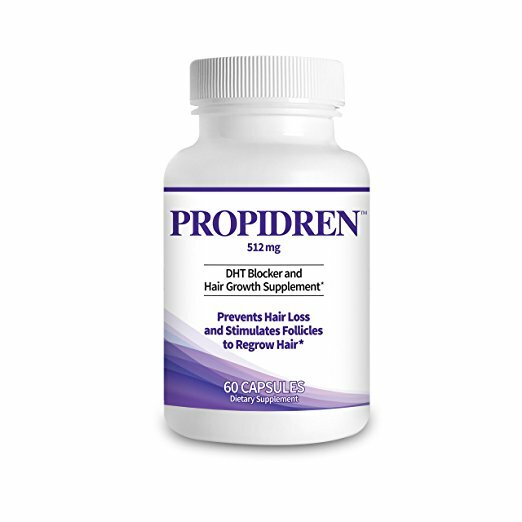 Vitamin C is one of the top vitamins to take for hair growth and it’s needed in order for the body to absorb iron (needed in order for the body to absorb iron an ingredient in the Propidren supplement listed above). Vitamin C fights oxidative stress that contributes to hair graying and hair loss and defends the body against cellular aging. Vitamin C can be found naturally in certain fruits and vegetables or you can take a supplement. No one likes to change their diet, even me, but the truth is, a healthier you will promote healthier hair regrowth. You might even just add some more vegetables to start? Maybe remove sugar and fast food? There’s different ways to have a healthier diet and it looks different for everyone, but it’s definitely something to consider when you’re wanting to grow your hair back. Keep track of your water, diet and supplements in a trichotillomania diary or therapy journal to help keep you motivated. I like trich therapy journals because they add that inspirational element, but a trich diary like this is good too. When you’re keeping track it seems to make the time go by faster and it’s nice to have something to look back on to see progress, especially if you’re going to consider a better diet and taking supplements. Related: 3 Ways I Dramatically Changed My Haircare Routine To Help Stop Trich.